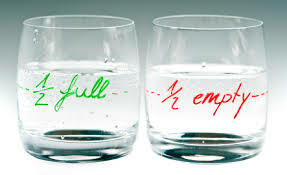 Medical Uncertainty: Are You a Glass Half Full or a Glass Half Empty Kind of Person? I’m dedicating today’s blog to my good friend and neighbor who has just spent what I would deem the weekend-from-hell-waiting-for-Monday. You see, what started last week as bad cramps and a feeling of bloating, with the likely diagnosis of ovarian cysts, has now morphed into a visit with a gyn-oncologist today. Very, very quickly. So, in my mind at least, waiting from when she first got a call from her gynecologist on Thursday saying that her CA-125 (a marker for ovarian cancer) was extremely high and that she had an appointment with the specialist to today would have been excruciating. I would have gone through every dire scenario and had me on my deathbed clasping my sons’ and husbands’ hands before my head hit the pillow Thursday night. Not my friend. She headed online, conducted extensive research, and entered, as she told us last night, the happy place of denial. And you know what? I really admire her for that. Because no matter what she learns today, she’ll never have this weekend back. And it was a beautiful weekend, not to mention her son’s 15th birthday. We had a lovely dinner with her and her family last night, sitting on the screened porch for more than an hour after eating and just talking. So, sure, she could have taken to her bed and adopted a “woe is me” attitude (and I know sooooo many people who would have done just that). But that wouldn’t have changed a thing except ruined the weekend for her and her family. We are all 99.9% sure that my friend’s problem is just ovarian cysts. . . not, well, the other. But I am 100 percent sure that if I’m ever facing a similar situation, I want to approach it with as much grace and wisdom as she has. Newer Why Do We Wait in Doctor’s Offices?